Sayu Bhojwani, Founder and President, The New American Leaders ProjectThe New Leaders Project seeks to create a more inclusive democracy by preparing first and second generation Americans to use their power and potential in elected office. Aimee Eubanks-Davis, Founder &; CEO, Braven Braven partners with educational institutions, volunteer professionals, and employers to offer a rigorous and relevant career readiness course, followed by robust campus-based alumni programming. From The Braven Accelerator will come a generation of leaders as diverse as our future demands. Yscaira Jimenez, CEO, LaborX LaborX is the LinkedIn for the LinkedOut, connecting skilled, untapped talent from alternative programs to hiring managers looking to expand their pipeline. Their mission is to improve the economic outcomes of low and mid skill workers by connecting them to living wage jobs in the innovation economy. They partner with workforce training programs and boot camps who are training the next generation of America's workforce. LaborX is sponsored by the Solidago Foundation. Laura Weidman Powers, Co-Founder and CEO, Code2040 Code2040 creates access, awareness, and opportunities for top Black and Latino/a engineering talent to ensure their leadership in the innovation economy. Code2040 aims to ensure that by the year 2040 - when the US will be majority-minority - Blacks and Latino/as are proportionally represented in America’s innovation economy as technologists, investors, thought leaders, and entrepreneurs. Carmen Rojas, CEO, The Workers Lab Through investing in entrepreneurs, community organizers, technologists, economic justice organizations, issue campaigns, and businesses, The Workers Lab seeks to create scalable and self-sustaining solutions that improve conditions for low-wage workers. Kiah Williams, Co-founder &; Director, SIRUM SIRUM aims to save people’s lives by allowing health facilities, manufacturers, wholesalers, and pharmacies to donate unused medicine rather than destroy it. Maria Vertkin, Founder & Executive Director, Found in Translation Found in Translation aims to help homeless and low-income multilingual women to achieve economic security through the use of their language skills, and to reduce ethnic, racial, and linguistic disparities in health care by unleashing bilingual talent into the workforce. Justine Zinkin, Chief Executive Officer, Neighborhood Trust Financial Partners Neighborhood Trust Financial Partners seeks to institutionalize financial education as a fundamental component of economic development initiatives-and to promote an action-oriented model which includes financial products and services sensitive to the nontraditional financial behavior of marginalized communities. 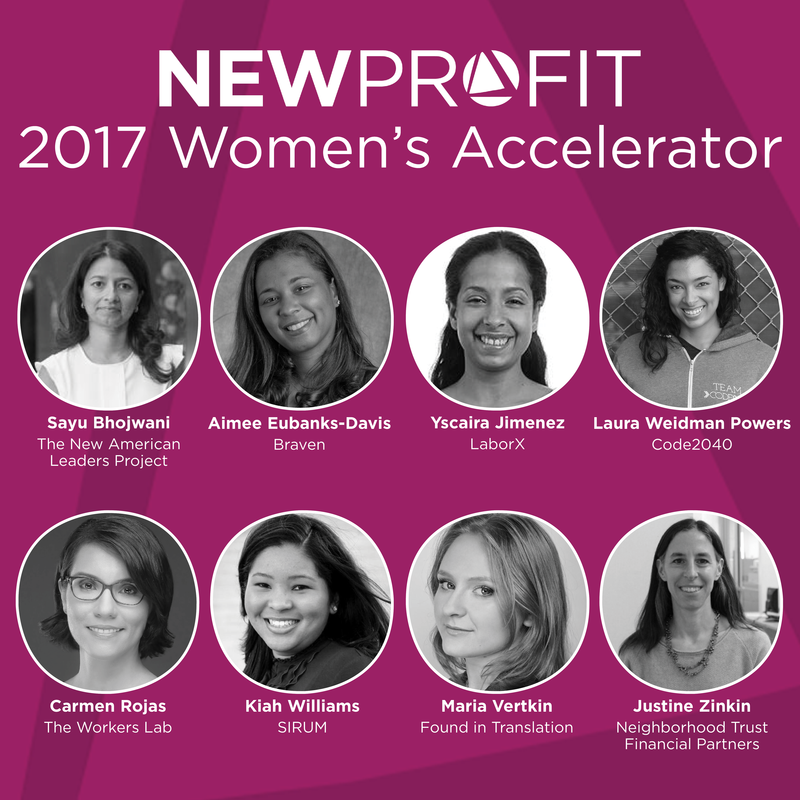 Women's Accelerator participants receive an unrestricted grant of $50,000, regular consultations with New Profit partners with expertise in nonprofit capacity building, and access to New Profit's larger learning community of social entrepreneurs and other changemakers through events like the annual Gathering of Leaders. The program is being run by Tulaine Montgomery, Managing Partner at New Profit. This cohort follows the success of the inaugural cohort in 2014: Jessica Sager, Co-Founder & Executive Director of All Our Kin; Alexandra Bernadotte, Founder & CEO of Beyond12; T. Morgan Dixon, Co-Founder & CEO of GirlTrek; Vanessa Garrison, Co-Founder & CFO of Girl Trek; Lisbeth Shepherd, Executive Director of Green City Force; Leila Janah, Founder & CEO of Samasource; and Maisha Moses, Executive Director of The Young People’s Project.